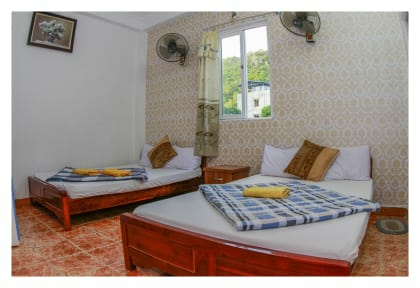 Catba Hostel i Cat Ba Island, Vietnam: Reservér nu! Catba, the most beautiful and the largest one in the archipelago of 1969 islands, is a natural world heritage amid the Ha Long Bay and was recognized by UNESCO as a World Biosphere Reserve on April 1, 2005. Lying about 60kim northeast of Hai Phong city, Catba is awarded by nature primeval beauty with mountains, hills, seashore, forest and caves. All of them create wonderful and charming scenery.Standing in the tourist center of Catba, the catbahostel , thanks to its favourable location, has a magnificent architecture with a leading diversified system of service of the island and always attracts tourists. 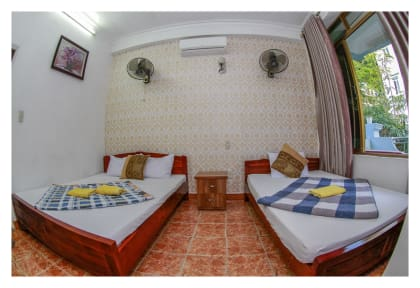 With 15 standard , equipped with up-to-date facilities (such as a system of international telephone, a TV network of more than 20 channels transmitted via the satellite, air conditioners, Wifi and comfortable bathrooms), the Catbahostel is always a reliable address for tourists when they come and stay in Catba. From Hanoi old quarter you can take a taxi to Luong Yen Bus station, buses departs every 15 minute from 6am to 8pm to Hai Phong, there are many companies operating this route.